Mindfulness and self-control are like two sides of the same coin. This is counterintuitive, because mindfulness is often described as “non-attachment” which sounds like it is more about letting go of control–letting things be as they are without judgment. The problem is that this state of non-judgmental awareness does not come easily. It is our natural instinct to judge things. Our minds do not turn off easily, preferring instead to constantly scan our surroundings for things to worry about. So as much as mindfulness is about remaining unattached, it is a state that we cannot attain without exercising a certain amount of self-control. In order to develop mindfulness, we have to strengthen our self-control. Mindfulness expert, Andy Puddicombe uses juggling as a great analogy to describe mindfulness. To keep the balls in the air you cannot become so unattached that you are not aware of what is going on. Without some engagement, the balls would drop. But you also don’t want to have such focused attention and anxiety about keeping the balls afloat that you become tense and agitated. The goal is to be like the accomplished juggler. Giving just enough attention to monitor the balls in the air but still able to have a conversation, or walk around, or read a newspaper article. But while the experienced juggler makes it look so easy, this automaticity only comes after hours and hours of dedicated practice. When I was a child, any time I saw an accomplished juggler I was always inspired to try and learn the art myself. Each time, I would rush home, find three tennis balls and begin experimenting with throwing them into the air. But no matter how many times I tried, they would come crashing down around me. 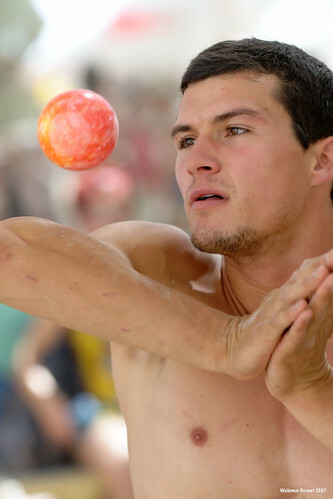 Juggling is much harder than the clown, magician, or street performer makes it look. This gives us a clue as to how self-control works. We sometimes think that having a lot of willpower means being able to exert this incredible force of will. We imagine trembling before some alluring temptation but controlling ourselves through sheer exertion of self-control. But this is not what self-control looks like at all. When somebody has it, they make it look effortless. Just like the juggler, it is as if an automatic program is running in the background keeping them in check. To learn how to develop self-control, it may be useful to consider how one learns the art of juggling. I eventually learned how to juggle by reading Juggling for the Complete Klutz (I’m dating myself, but this book is probably the progenitor of the entire “for Dummies” book series.) As it turns out, the secret to learning how to juggle is beautiful in its simplicity: you start with one ball. I would suggest the same approach with developing mindfulness or any other self-control practice . . . start with one ball. In other words start with small practices where you know you cannot fail. Juggling is a common analogy for our ability to control everything that is going on in our lives. “I’m having a hard time juggling everything,” we’ll say. Or “I can’t keep all these balls in the air.” The reality is we’ll never be able to keep several balls in the air . . . until we master juggling with one. Cassidy, J. & Rimeaux, B. C. (2007). Juggling for the Complete Klutz (30th Anniversary Edition.) Klutz.